I had the pleasure of attending a great new costuming symposium in the Midwest this last weekend: Figments and Filaments, in Independence, MO. It was certainly a long way from home, but worth the traveling. I’ve never been to Missouri, and I have plenty of friends in the Kansas City area who were more than happy to give me crash space. Naturally, fellow Byzanteamster Konstantia Kaleothina was my host, and with our powers combined with Andrixos, we were the Byzanteam! Taking the fashion show by storm! 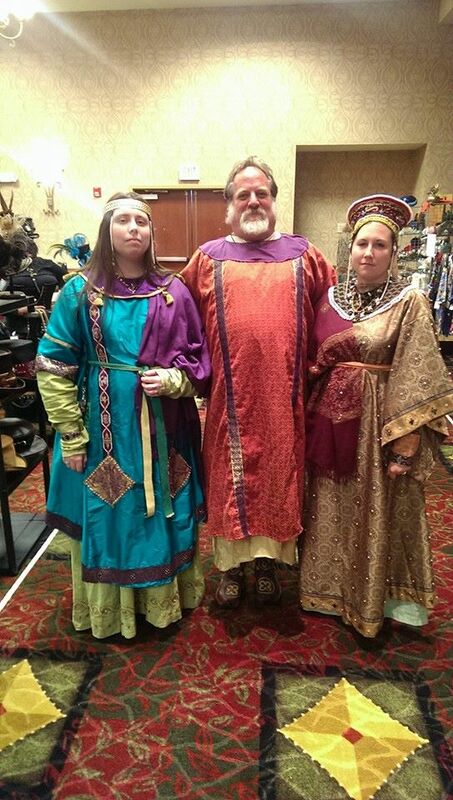 I taught 2 classes: My Historical Costuming for Cosplayers one, and my 2 hour long Roman dress one, and we actually got to the Byzantine part, hurray! It’s so odd watching yourself on screen. I also took the train there and back, you know, to do something different (and it was cheaper.) I will definitely take the train long distance again. That was fun, and everybody should do it at least once. I have so much wonderful things to say about this convention, I don’t even know where to start. Yes, it was small, and it was its first year, but it ran well, and everyone seemed to have had a really great time. Even this slightly aggressive Easterner. 😉 They want me back for next year, so I’ll be planning that return trip shortly. Check out their website at Figmentsandfilaments.com, and the respective Facebook groups and pages. Since I had so much time on my hands on the train, I stared at the Bamberg Textile again for a while, and now another blog is cooking while I start planning to turn a piece of red-orange linen into a short stola. Mwahahaha. 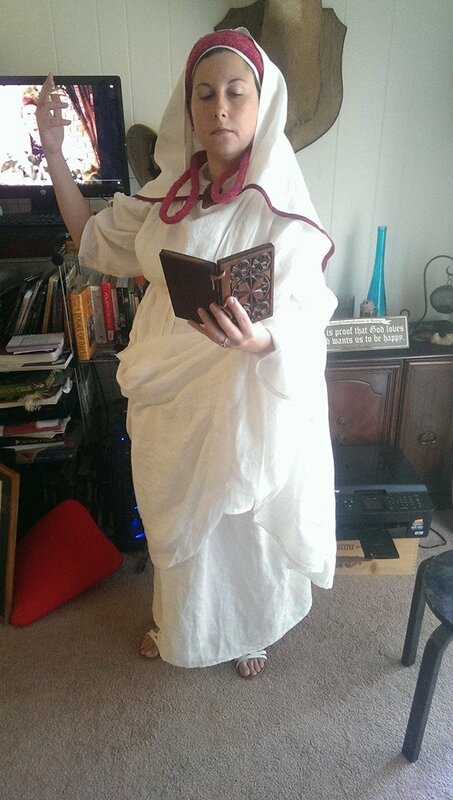 I entered the historical reenactment costume contest over at Fabrics-Store.com, which has taken more of my money than I care to mention. Please, if you have the time…every day…for the next 16 days…to vote for my entries once per day, please do! Operation: Whiter Shade of Pale. The Coronation of Brennan and Caoilfhionn and my journey to become a Vestal Virgin. There’s a great deal that I could say about what goes on behind the scenes at events. I’m unsure how in-depth other kingdoms go, but here in the East, we like to be rather grandiose with coronations. I’ve autocratted royal progress events before, but I’ve never really been apart of the research and development strike team, so to speak, so this is a summarized post of my experience working on the spring coronation here in the East Kingdom. Several months ago, I was approached by Master Steffan ap Kennydd about aiding him in designing a unique coronation ordo for the incoming heirs. It was going to be wildly anachronistic, as we were replacing 7th Century Saxons with 1st Century Romano-Hibernians, and I agreed, knowing that this could be a lot of fun. Since Kenric II is the cousin of the martyred Kenric I, who was killed mysteriously by an archer bearing black arrows, visions of this sainted king have been plaguing his cousin. We had the benefit of working with 3 very superstitious cultures, so this was going to work. It would be far-fetched and as anachronistic as we could muster transitioning smoothly between time periods without a TARDIS, but this was going to rock. “King of the East! I speak your wyrd. in the rising smoke, in the curling clouds. King of the East, I speak your wyrd. The wolf is coming, cloaked in splendor. The eagles scream above his stride. the victorious wolf hard at his heels. are swallowed by the shadow of the wolf bearing the eagle. “Wyrd” from what I understand, is a very Anglo-Saxon concept, so is the white horse. The Irish revered wolves, while the Saxons found them to be bad omens. In this case, the wolf is also in Brennan’s arms, so it worked. The Eagle of course, is Rome. So Brennan essentially became, “The wolf bearing the eagle.” The “three pale moons” are Kenric’s arms. It’s vague, it’s spooky, and it was perfect. “Rex Orientis, fatum tuum dico. Video in volatum avum, in fumo oriente, in nubibus volventibus. Rex Orientis, fatum tuum dico. Lupus venit, palliatus fulgore. Aquilae clangunt super passibus suis. Equus albus descendit de loco alto, lupo victorioso vincendo. Tres lunae pallidae virtute coronatae umbra lupi aquilam ferentis voratae sunt. This was more of a geek-fest for us rather than everyone else, but we enjoyed it. Next came the performance aspect. 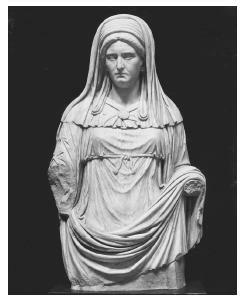 Aife and myself were conscripted into duty as the seeresses, and I took on the role of a Vestal Virgin, the most well-known and recognizable Roman priestess. I’m hardly virginal material *cough* but for the day, it would be well worth the project. 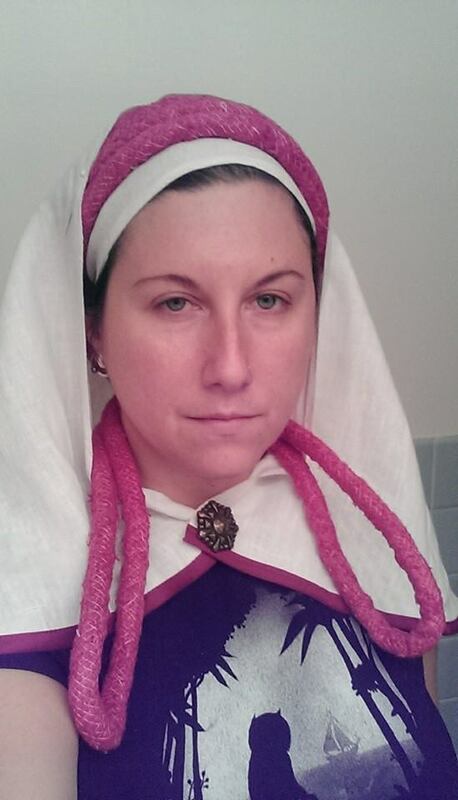 Vestal garb is relatively simple, with some twists. 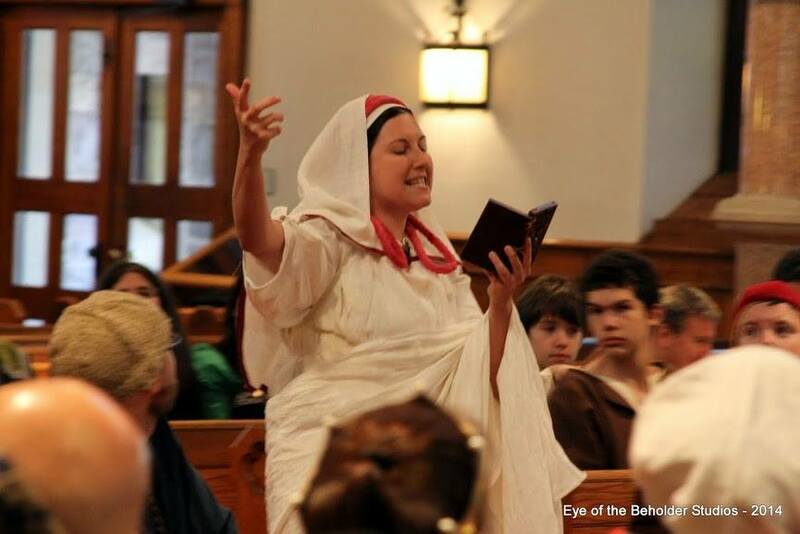 I reached out to Maestra Julia Sempronia of An Tir, who had recently received her Laurel while donning the robes of the Vestal, and she was a great source of help, as well as others from the Romans of the SCA Facebook page. In addition to wearing all white, the most important part of the Vestal was the headwear, the infula (fillet) and suffibulum (veil.) Other than that, I needed white sandals, a white chiton, and a white palla. Those pretty much took care of themselves. However, I need to proudly display my sandals for a bit, because even though they’re modern, I found a pair that had a trinity knot as part of the design. So not only was I Roman, I was wearing what could be considered a rather Irish symbol, that could easily stand for all three cultures represented in the ceremony: Saxon, Irish, and Roman. Gods, I’m a NERD. Back to the headwear. The infula was going to be the worst part. I needed to make funky round bands of funkiness in red, long enough to wrap around my head 5 times and have 2 loops over my shoulders. What I did on Maestra Julia’s suggestion was purchase cotton cording used to edge pillows, and dyed it red. It took me two dye baths to get it the right shade, and the dying process did leave the cotton looking a bit weathered and raggy, almost like felted wool. So I got the right look. 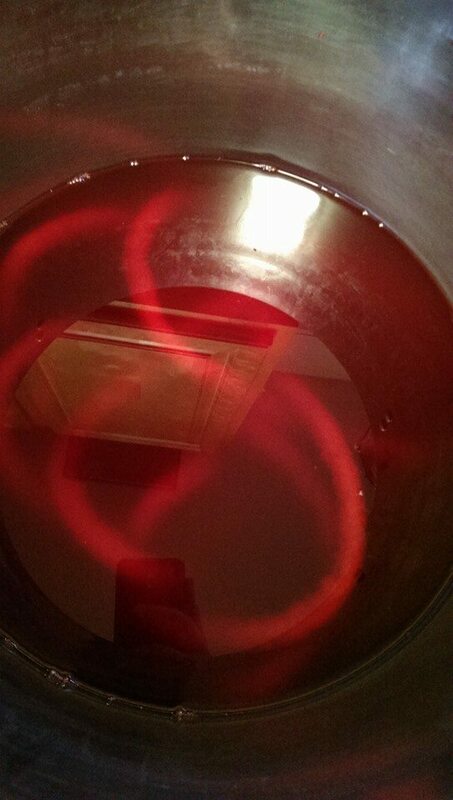 It even faded just a bit like period red dyes do. I posted this as-is on Facebook. Imagine the responses. I was still missing pieces to the puzzle. The infula slipped off of my short hair very easily, so I was reminded that I needed a vitta, or a plain white fillet to keep it in place. I simply cut and hemmed a small rectangle of white linen, and that did the job. Next was the suffibulum, or veil. This took a bit more troubleshooting than I thought it would. 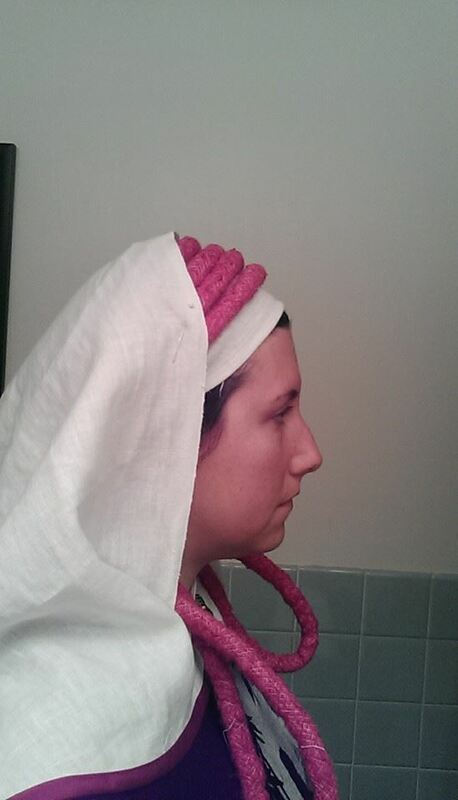 I needed to get the right shape to have it drape across my shoulders evenly. I tried a few rectangles, and then had a moment of pure “derp” when it was suggested by Domina Vestia on the Romans of the SCA page that it should be semi-circular. That did the trick. 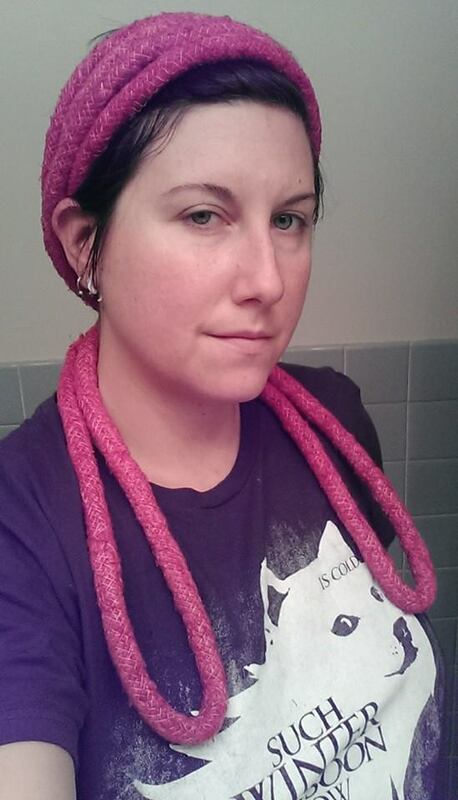 I trimmed it in deep reddish-purple bias tape, and made a brooch out of a huge shank button I found at Joann’s, and the headwear problem was solved. Of course, that was just the beginning, now the fun began. We had the words, we had the garb. I couldn’t memorize the lines entirely, so I cheated and taped them into my wax tablet. It did the job. Let’s spook the Eastern Populace. You can’t have a victorious emperor of Rome come into court without showing off! It was my idea that Brennan and Caoilfhionn have a Triumph to begin their First Court. And although I couldn’t convince his Imperial Majesty to paint his face red, what resulted was an epic, and I do mean EPIC parade of regalia and pomp into court unlike anything I think the East has ever seen. Brennan paraded in after the kingdom champions, and I stood behind him, holding one of the Eastern crowns over his head, and chanting, “Respice post te, hominem te memento.” This translates to, “Look behind you and remember that you are but a man.” This was done typically by a slave with a laurel wreath, on the triumphator’s quadriga (4 horse chariot.) It reminded the emperor or general that they were still mortal, and not a god, and to control their hubris and pride. I have several reports that I gave members of the populace chills by doing this. Her Imperial Majesty Caoilfhionn was carried in on a lectica, surrounded by the artifacts and relics of the East Kingdom, as well as amazing displays of heraldry as Roman vexillae. I missed the second half of the show because as soon as I got to the dais, I bolted to the royal room to change into less…conspicuous clothing so that I could enjoy court and be called upon as a member of the Queen’s Guard. qaStaHvIS Hu’DI’ loD tlhIch, qaStaHvIS chen. paw Qongbogh chalDaq tlha’ Dat, qaStaHvIS ben law’ batlhmey So’. Qap Qongbogh chalDaq tlha’ Dat let yISum. ghup pong Qongbogh chalDaq tlha’ Dat toQDuj SIQ QIb. Let me tell you all how hard it is to paint very light gray hair. Also learned: Sometimes, your egg tempera medium just blows, and doesn’t work well. I had a really rough time dealing with my yellow ochre and vine black pigments this project, and I’m unsure why. Apparently it could do with the temperature of the medium (using it right out of the fridge) or my ratio of egg to wine. This is an icon of St. Kenric I of Warwick, late King of the East. His martyrdom is signified by the wearing of a red cloak, and his death by black arrow is immortalized. This is a great schtick we have going in the East Kingdom right now as we try to discover the murderer of our former king. This icon is a donation to the Silent Auction we are running this weekend at the Coronation of Brennan and Caoilfhoinn to benefit the Royal War Chest Coffers. As you can see, I’m getting better, but not great yet. This was a great opportunity for practice, and man did it take some time. I’ll be making a page for my iconography soon. I figure it’s the best way to document my journey through the art form rather than scattered blog posts. Because of the impending doom, er, Coronation, I’ve been getting pinged a lot here in the East on how I tie my chiton and get my Roman clothing to drape properly. So, I made this handy dandy 10 minute vid to help explain my method, as well as give a brief look at my new dark blue stola. I hope it helps. 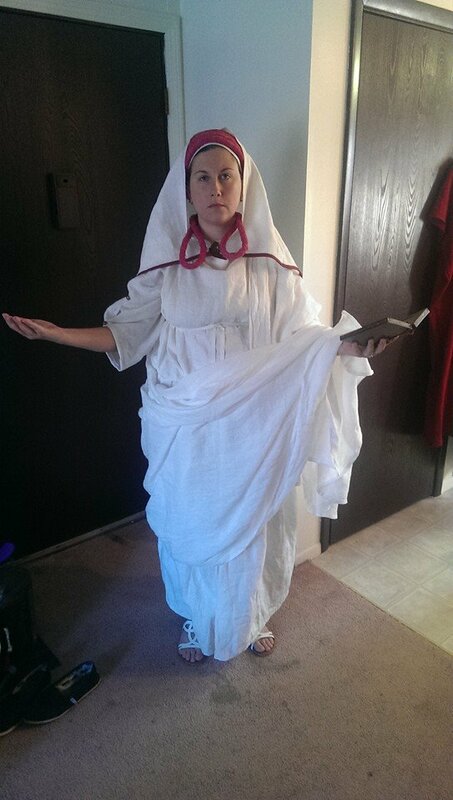 The Roman Matron: How to belt a chiton and an intro to the stola. from Anna Dokeianina Syrakousina on Vimeo.